China's aircraft carrier, the rebuilt Kuznetsov class Liaoning, and its battle group are prowling their way towards Southeast Asia ahead of a much anticipated inaugural and very high-profile visit to Hong Kong. The carrier's port call, which will be yet another major symbol of China's rapidly increasingly military and geopolitical might in the region, is part of the 20th anniversary celebration of the country's reclaiming of the territory from the British Crown. The armada passed through the Taiwan Strait over the weekend, an operation that causes anxieties to soar in Taipei. Fighters and maritime patrol aircraft scrambled from the island to closely monitor the flotilla's transit, and there have been no subsequent reports of any unexpected incidents occurring. Liaoning put up an aerial presence of its own sometime during its voyage south from its home in Qingdao. It left the port city on June 25th. A new video has been published containing a montage of footage showing the carrier and its battle group flexing its operational muscle during drills. The video includes some interesting clips, such as in-cockpit footage of J-15 fighter operations and Landing Signal Officers waving jets onto the boat. Even video of the ship's arresting gear systems in action is featured, along with footage of the ship launching and recovering its contingent of aircraft, with armed J-15s fighters being the highlight. 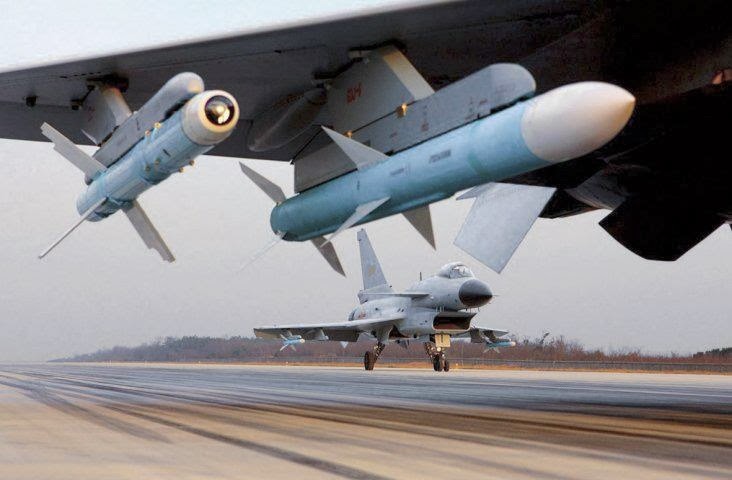 The big Su-33 clones are seen carrying a pair of PL-12 medium-range air-to-air missiles, along with a pair PL-8 short-range air-to-air missiles. This is also a common PLAAF loadout. Maybe most interestingly, some J-15s are sporting YJ-83K "Eagle Strike" anti-ship missiles under their wings. This is a semi-official Chinese website with great high-resolution photos of the drills shown in the video. The air-to-air weapons appear to be inert captive training rounds, not live missiles. The YJ-83Ks are also likely of the same flavor, although the red bands are interesting, as internationally red/orange bands usually means the weapon is live. The Chinese are also very aware of the fact any imagery they release will be poured over by foreign intelligence services, so maybe it is just a way to confuse analysts. Training to operate from the ship with loadouts that represent the two core mission sets of the air wing's fighter cadre—air defense and naval strike—makes total sense. Much debate has occurred in military aviation circles about just what type of loadouts these big navalized Flanker derivatives can lug off the deck with a little help from a ski jump. It's not worth re-litigating this issue here, but multiple factors go into keeping these jets within their operating envelopes during launch. These include how much fuel they are carrying, the wind speed over the deck, as well as their external payload configuration. What we see here is likely representative of J-15 combat operations while maintaining a relevant fuel load, give or take a couple air-to-air missiles. These configurations are also roughly similar in weight to the loadouts we saw on Russian Su-33s operating off the coast of Syria aboard the Kuznetsov late last year. The Liaoning's visit to Hong Kong has become a e-ticket attraction for Hong Kong residents, with throngs of Hongkongers lining up, and some camping out in line to be able to get a ticket to tour the ship and three of her escorts. Reports state that just 2,000 tickets were going to be given out to the general public for the carrier's historic visit, with another 1,600 being distributed to special persons and organizations. It is the first time the Liaoning has been opened up to large-scale public tours, or really any public access of any type. The Liaoning's battle group is slated to be in Hong Kong from Friday to Tuesday. The visit also comes as China has been on quite the roll when it comes to very high-profile events related to the country's ongoing naval buildup. The People's Liberation Army Navy launched its biggest and most powerful modern surface combatant, the Type 055 Destroyer, last week and its first indigenously-built aircraft late last April. The weekends festivities are sure to make international headlines, especially in countries in the region who are deeply concerned with China's increasingly potent military might. In addition to the Liaoning, and many other examples of Chinese military hardware, the PLAAF's most prized aircraft, the stealth J-20, is also rumored to make an appearance in Hong Kong this weekend for the celebration.